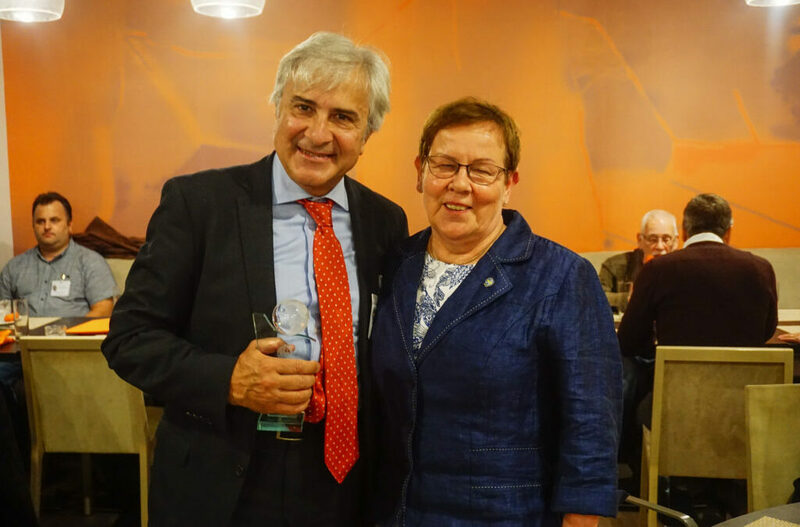 The GAMIAN-Europe Annual Convention celebrated in Budapest during the 22nd to 24th September 2017, was an exceptional opportunity not only to gather GAMIAN-Europe’s members but also to give the European Personality Award to the outstanding psychiatrist from Italy, Dr. Roberto Mezzina. 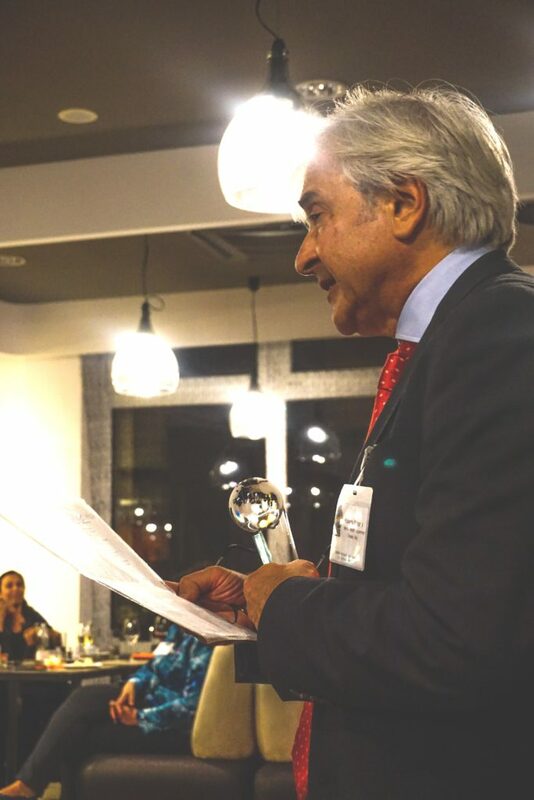 Dr. Roberto Mezzina received the award not only for his work on the creation of a network of alternative community services in Trieste, Italy which support patients in their daily lives with a view towards total recovery and social inclusion but also for his trajectory of more than 30 years supporting mental health patients. He is currently the Director of the Department of Mental Health in Trieste, Italy. Full biography available here. The ceremony took place at the Hotel Park Inn in Budapest and was accompanied by a dinner that had the participation of GAMIAN-Europe’s president Hilkka Kärkkäinen who handed over the award to Dr. Mezzina. In Italy, deinstitutionalization has been completed 18 years ago with the closure of all asylums – and this year also of forensic hospitals. The Legislation of 1978 was based on the “discovery” of rights as the key tool in mental health care. Trieste has been the in-live experiment of an entire city: ensuring care within the community – hence with a full inclusion – in the exercise of freedom, with open doors and without places of restraint and exclusion. This is still a unique place in the world, is a WHO Collaborating Centre, and a model for worldwide services, spoken by Le Monde, Asahi Shimbun or the Economist, attended by a thousand people from thirty countries every year. They come to see this model, in its present time, not a museum. A pattern, or a work, that was exported to Brazil, Argentina, Spain, ex-Yugoslavia, Greece and elsewhere. This important recognition goes to Trieste’s entire experience, but not just from the historical point of view. Today Trieste is more than ever an international point of reference for community mental health, with an open system based on the centrality of the person. Current services are considered a worldwide model especially for respect for human rights and the realization of the full citizenship of people with psychosocial disabilities. To achieve this, it employs a global approach to life and health needs, working on social determinants and inclusion. It is a service based on values and ethics as well as on good practices and scientific evidence. The Mental Health Department of Trieste has for years been working on improving the quality of care of people with mental health problems in institutions with the aim of achieving civil rights and citizenship. Through the closure of the asylum and the simultaneous development of community based services – a process that has favored in various countries around the world, from the Balkans to Latin America, from Palestine to Australia – has meant to act on quality of life through personalization of care and the involvement of users, carers and the social context. This is not only to improve treatments and therapies, but also to realize unique recovery pathways and liberate the person with mental health issues from abuse and discrimination. “We want to change the scheme that makes the mentally ill a dead body, and we try to turn the mental patient dead into the asylum in a living person, responsible for his own health … Certainly, one of the most important therapies to fight madness is freedom”. Deinstitutionalization was, therefore, a starting point, and even now it is a necessary step, by substituting community for hospital care and voluntary for involuntary care wherever possible. This could break the traditional nexus between custodial psychiatry and denial of human rights & social exclusion, or marginalization in institutional facilities and generally in mental health care. “Liberty is therapeutic” was in the 70s the motto of the Trieste experience, which is still preserving that legacy. ‘Freedom first’, the new slogan of the international movement for better care in a rights-based and person-centred approach, emphasizes this is not an outcome but a pre-condition for care. We would like to go definitely away from a Psychiatry as part of the global oppression and its forces, as denounced by the Special Rapporteur on the right to health recently. Is it possible? We can say yes but through a paradigm shift: from the institutions to the community, from the illness to the person – its subjectivity and social being. Are we moving toward a ‘soft’ – or gentle – Psychiatry? I think so. In order to do that, without refusing our responsibility and accountability, we should try to change the nature of Psychiatry from coercion & detention in institutions, not only avoid human rights abuses. We need choice eg offering consistent home care; negotiation as the main principle, but with a citizen with rights. Instead of coercion and locked doors, or mechanical restraint, we need psychosocial intervention eg work, home, talking therapies. We need shared responsibility, supported decision making, guarantees for treatment; we need shared alternatives, dialogical approaches, crisis and recovery homes, early support, de-escalation of the crisis, easy accessibility of services. The abolishment of coercion can generate a Psychiatry with spotted weapons. It can recognize the power of the individual even he or she is a state of extreme need to be understood, loved and cared. We desperately need a gentle way of dealing with persons and delivering care. If organizations are driven by principles and values embedding human rights approach, their practice can prove to be inherently healing. So elements of change are rights, opportunities, empowerment of users and other stakeholders as leaders. The new frontier is about not only fighting against asylums on one hand, and on the other hand advocating rights, but a convergence of both strategies. We declare the right to be a citizen as well as the right to have a life. It requires opportunities and the prospect of a whole life. A person with a mental health problem has the same basic human needs as all of us. Recognizing the whole person is the way to develop and lead a life that is full of purpose, interest, recognition, contribution, value and reward. Thus we must speak about entitlements: we need a social and human development that could converge, not conflict, with substantive, individual rights. A possibility seems to be a focus on exclusion in society, therefore a focus on social determinants like home, work, supports, relationships, participation and many other aspects. A political and social action must be combined with a change of institutional practice and thinking in mental health and social care. We are honoured that today, thanks to Gamian-Europe, there is a recognition of the work done in half a century to continue Franco Basaglia’s action for those rights, and for an Ethics of the Other, who sees it and acknowledges it as close to us despite the difference. But we must point out that the main outcome is the vital and living presence of people, subjects returned to a life, beyond and above of changes in institutions.